Crossmaglen Rangers are Ulster club champions for an 11th time after an extra-time victory over Scotstown. The final was in the balance until a poor kick-out by Scotstown keeper Rory Beggan gifted a goal to Kyle Carragher in the second additional period. Substitute Brian McGinnity got a late goal for the Monaghan men to pull it back to 2-15 to 2-12. But Cross, whose first goal was scored by Tony Kernan, added two points to seal their place in the All-Ireland. Scotstown had led early in the match thanks to a Darren Hughes goal, but Cross fought back to lead 1-6 to 1-3 at half-time. In the first period of extra-time Scotstown's Kieran Hughes was sent-off for a high and late tackle and near the end his brother Darren was also red-carded. Cross substitute Danny O'Callaghan was sent-off in the second half for an off-the-ball striking offence, but the Armagh team were restored to the full 15 men for extra-time. James Morgan of Crossmaglen was also sent-off after picking up two yellow cards in extra-time but by that stage Rangers had the Seamus McFerran Cup in the bag. 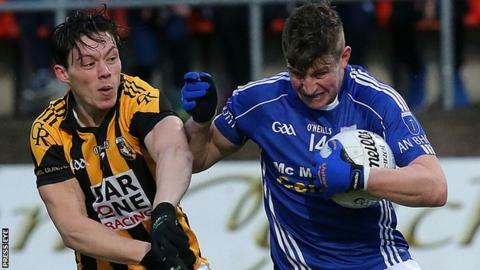 The win puts Crossmaglen into the semi-finals of the All-Ireland club competition in which they will play Castlebar who recently beat Corofin in the Connacht final. Crossmaglen joint-manager Oisin McConville: "It was an unbelievable battle but we got there in the end and that is the important thing. "We let our guard slip for a spell in the second half which was not good, but there is a lot of fight in our team. We used every single one of our men. "We play Castlebar in the All-Ireland now. I watched them last week and they are a phenomenal side, but we have a couple of months to prepare for that." Scotstown joint-manager Mattie McGleenan: "I am very proud of my players. They showed true Scotstown steel and I could not have asked any more of them. "We had a superb second half and kept taking the game to Crossmaglen. We were not going to stand off them. "We had opportunities to win the game in normal time but did not take them. Crossmaglen took theirs to finish the game in extra-time and that is the difference between winners and losers."